Ann Arbor, Mich. — A U-M team of researchers investigating the fundamental cause of Dravet syndrome, a severe childhood epilepsy, have reprogrammed fibroblasts, a type of skin cell, from Dravet patients and generated patient-specific neurons – which could help determine new therapies or better medications for the syndrome. 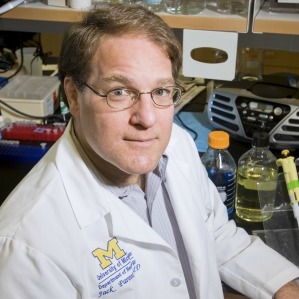 Jack M. Parent, M.D., associate professor of Neurology at U-M, working in collaboration with U-M researchers Lori Isom, Ph.D., professor of Pharmacology and Miriam Meisler, Ph.D. professor of Human Genetics, found that these patient-derived neurons showed increased excitability, abnormal neuronal behavior that can produce seizures. This novel approach toward unraveling the pathophysiological mechanism behind Dravet syndrome was reported Saturday at the American Epilepsy Society’s 65th annual meeting at the Baltimore Convention Center. Parent, who is also co-director of U-M’s EEG/Epilepsy Program, and his team obtained fibroblasts from both Dravet patients and unaffected controls and reprogrammed the cells to induced pluripotent stem cells (iPSCs) by gene transfer. Forebrain-like neurons were generated from the iPSCs and studied for their electro-physical properties. The Dravet-derived neurons displayed a lower threshold for electrical activity, more repetitive firing, and increased firing frequency than control neurons. “These findings indicate that patient-specific mutant Dravet cells can be reprogrammed to successfully model an epileptic-like phenotype with in vitro seizure-like activity,” Parent says. This approach should also have broader applications in screening new treatments for other neurological disorders, Parent says. About the University of Michigan Department of Neurology: The Neurology inpatient service provides care for acutely ill patients with neurologic disease, and includes a dedicated intensive care unit, a separate stroke unit, and inpatient epilepsy monitoring beds. Outpatient subspecialty clinics in multiple sclerosis, neuromuscular disease, epilepsy, stroke, neuro-oncology, movement disorders, cognitive disorders, balance disorders, headache and neuropathic pain provide state-of-the art care for more than 25,000 patient visits annually. In extensive basic and translational clinical research programs in the department, faculty-led programs funded by the National Institutes of Health, the Department of Veterans Affairs, private foundations and philanthropy seek to advance our understanding of neurologic disease and develop new and better treatments for a variety of neurologic conditions.